Capitol Weekly’s A Conference on Water, held on February 20, 2014, brought together legislators, officials, and stakeholders to discuss some of the most pressing water issues facing the state today. In this panel discussion moderated by Capital Public Radio’s Amy Quinton, State Water Resources Control Board Chair Felicia Marcus, Restore the Delta’s Barbara Barrigan-Parilla, Contra Costa Water District Assistant General Manager Marguerite Patil, Senator Lois Wolk, and the Natural Heritage Institute’s Jerry Meral discuss the drought, conservation, agriculture and more in a rare discussion about the Delta that, surprisingly, includes very little discussion about the Bay Delta Conservation Plan. Amy Quinton, moderator: The Delta is the heart of California’s water system. Snowmelt in the Sierra Nevada flows through the Delta, providing a water supply for 25 million Californians in the Bay Area, Central Valley, and Southern California. The Delta is also home to half a million people, it’s the West Coast’s largest estuary with hundreds of species of fish and wildlife. Our water delivery systems, our urban and agricultural development have had a hand in altering the Delta’s environment to the detriment of many fish species. Balancing the diverse needs for the Delta is a consummate challenge in California and the debate that has obviously been continuing for decades. The Bay Delta Conservation Plan which proposes building two tunnels to carry water from the Sacramento River south may be the answer, it may not. This is the cliff notes version of the Delta; everyone here on the panel has a different opinion on how the needs of the Delta should be balanced, and each one of you has your own unique role in how your organization fits into that debate. Amy then invited the panelists to start off with an opening statement about the Delta. The Bay Delta Conservation Plan will need to ask the State Water Board for a permit to modify their existing water rights permits for the projects, said Ms. Marcus, noting that the water board’s role is not to review whether they did a good job or not – that’s what the Delta Council will get to do. “The water rights permit has a number of features – it has flow, the amount of water, it has a season and it has a place and method of diversion,” she said. “In this case, they would be asking for an additional place of diversion. That will be an evidentiary adjudicatory process and hearing in front of us and could take quite awhile. We’ll have to do two things. One is that we have to make a finding that it won’t adversely affect fish and wildlife, the public trust resources, and we’ll have to make a finding that it won’t adversely affect any other legal users of water and water rights.” She added that it will be a very complex and length process. The 2009 legislation included reporting requirements that, for the first time for some people, required reporting of how much water they were diverting. “For the seniors, it’s every three years and for the people who are the post-1914 appropriative water right permit and license holders, it’s every year,” she said. “We didn’t have that data necessarily before,” she said, noting that the legislation also appointed a Delta Watermaster to oversee it all and people have been doing a pretty good job. Governor Brown has yet to meet with water agency leaders and leaders from the Delta community to discuss the impacts of the Bay Delta Conservation Plan on the Delta, and last week, President Obama was out touring with representatives, while Delta residents were reduced to driving down roads in Firebaugh trying to get as legally close to the President as permissible, she pointed out. Senator Wolk began by noting that she represent four of the five Delta Counties: Yolo, Solano, Contra Costa and Sacramento, and that she will always represent San Joaquin, even though she doesn’t officially any longer. “There are lots of things that can be done and I think we have to be practical and frankly stop talking about the BDCP,” concluded Ms. Wolk. Amy Quinton (moderator): Because we are in a drought and it seems to be the topic on everyone’s mind, how is the drought going to affect the Delta? I recall reading that the last time we had such a serious drought in 76-77, there was a big problem with salt water intrusion. What’s everyone’s biggest concern, this time around? Felicia, how do you deal with salt water intrusion? “You can always prepare for drought; it’s always hard to judge whether it’s going to happen next year so it’s a reminder to us that we really have to plan ahead and figure out how to diversify our local water sources so that we’re not as dependent on this system we have now,” concluded Ms. Marcus. Marguerite, what’s your biggest concern with the drought? A lot has changed since the 70s, now you have a reservoir helping with salinity issues. Is that going to help this time around? It was the impacts of the 1976-77 that motivated Contra Costa Water District to build Los Vaqueros, responded Marguerite Patil. “The state and feds had looked at that project since the 50s and just didn’t get it off the ground, so we spent $450 million building Los Vaqueros, over $100 million adding a new intake with better quality water on Victoria Canal and another $100 million expanding it, so we’re $600 almost $700 million in at this point, but in a year like this, we’re really grateful we did it. We’re just fortunate that we moved forward on the construction of the expansion at the right time when it was already dry, but I personally did everything I could to get as much water in there as possible last year,” noting that she was able to get to 133,000 AF out of the 160,000 they could have put in. “That water we’re putting to very good use this year, not only for our district but to the Bay Area region,” she said, noting that they were going to try and transfer water to other water agencies who are in bad shape. She noted they were also working with others to figure out how to provide more water, and the temporary barriers are being considered to help protect the water quality, and they are also looking at delivering recycled water to meet their industrial needs. “We can’t really cut our oil refineries back very much without it influencing production, it’s sort of a 1:1 correlation there, so we want to see if we can fast-track some recycled water projects that are on the table and help that situation,” Ms. Patil said. Senator, what is your biggest concern with the drought? It’s interesting to hear all the debate about water quality. You’re talking with a severe drought, basic health and safety issues for humans, but what gets left behind are the species, the ecology. Jerry, talk to me a little bit about that. Is that being neglected? One of the things we talk about during drought is conservation and you also here that Northern California doesn’t do a very good job with conservation compared to Southern California. So this is directed to you Marguerite. What is the attitude about conservation? You obviously have enough water right now. Is there sort of focus on conservation? Marguerite Patil said her customers have been focused on conservation for decades now, noting that after the last dry period, demand didn’t creep up as much as they normally see. “It’s a little bit hard to tease out how much of that is because of the economy, how much of that is because people like conserving water, but they like saving money on their bills, absolutely, so we’ve tried to make sure that they see that financial benefit to themselves.” They’ve had huge success with toilet rebates, low flow showerheads, and internal plumbing improvements, but where they see the greatest potential for improvement is in the outdoor landscapes. I know that there’s been some districts who have put into place mandatory conservation. It seems hard for me to believe that’s not going on everywhere given the severity of the drought. Why is there seemingly this hesitancy? “I think we have to retire land as part of the solution, especially the drainage impaired lands in Westlands and I think we have hard decisions to be made by policymakers on what kind of agriculture we can really support where and for how long in California,” said Ms. Barrigan-Parilla. Sit in the chair and ponder … what next for California agriculture? Rogene Reynolds from the South Delta asks the panelists to comment on the CVP and SWP contract allocations which exceed Delta inflow or the availability of Delta water. 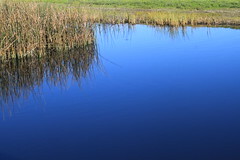 How can those be renegotiated, reworked to truly reflect the water that’s available? Click here to view the video for this panel. Click here to view video of all panels for this event. Click here to visit Capitol Weekly online.